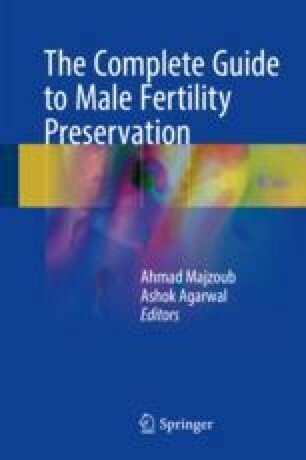 Male cancer patients are increasingly interested in pursuing fertility preservation prior to undergoing gonadotoxic cancer treatments. However many patients do not receive appropriate fertility preservation counseling or referral for fertility preservation treatment. Both patient-specific and institutional barriers have been identified which limit patients’ ability to complete fertility preservation treatment. Many of the identified institutional barriers have the ability to result in disparate fertility preservation counseling. Patients who do not receive appropriate fertility preservation counseling are at risk of future regret, anger, sadness, and other negative psychological outcomes and potentially decreased chances of future genetic family building. For patients who do receive fertility preservation counseling, their current emotional status as well as that of their loved ones related to the patient’s cancer diagnosis may interfere with decision-making ability. Patients who accept or decline fertility preservation treatment may face additional psychological risks. Regardless, all cancer patients who will be exposed to gonadotoxic treatments should receive fertility preservation counseling and referral for additional counseling by a fertility specialist. The psychological complexity of fertility preservation in newly diagnosed cancer patients suggests that the inclusion of counseling from an appropriately trained mental health professional is also warranted.